In 1911,the Coal Mines Act was passed and under the general regulations embodied in the Act it became the duty of all coal owners, to whom the regulations applied, to make adequate provision in the manner laid down for the establishment of rescue work in mines, and for the maintenance of rescue apparatus. Briefly, it meant that rescue stations had to be provided so that all mines were within a radius of 10 miles of a station, unless they employed less than 100 men or were specially exempted from the provisions of the regulations. Some years later, the limit was raised to 15 miles. 2. Mansfield Woodhouse station superintendent J.G. 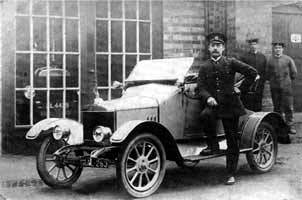 Huskisson stands by a Standard motor car c. 1912. As a consequence, the next few years saw a rapid increase in the number of rescue stations, some of which were already under construction before the Act came into force, until all the coalfields in the country were covered by a comprehensive network of stations, many of which are still in operation today. 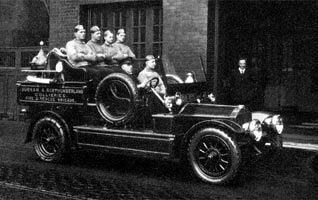 Some of these stations were to be the forerunners of what are still commonly referred to as Scheme 'A' stations where permanent teams of men, as at Ilkeston, were employed full time, with trained men from the collieries supplementing the full time members. The majority, however, were to be what are known as Scheme 'B' stations where a small nucleus of officers and instructors are employed at the station to train men from the pits. (a) In Scotland, at Kilmarnock, Coatbridge and at the University of Heriot Watt. In order to comply with the regulations, there were also several sub-stations attached to Coatbridge and Heriot-Watt. (b) In Northumberland and Durham, at Ashington, Houghton-le-Spring and Crook. (c) In Yorkshire, at Brierley, Rotherham, Wakefield, Doncaster and Barnsley. (d) In the East Midlands, at Ashby, Ilkeston and Chesterfield. (e) In Lancashire, at St. Helens, Coppull, Skelmersdale, Denton and Burnley. (f) In North Wales, at Wrexham and Mold. (g) In Cumberland, at Brigham. (h) In the West Midlands, at Haunchwood, Lilleshall, Wilnecote, Dudley and Hednesford. (i) In the Bristol, Somerset and Forest of Dean coalfields, at Bristol, Norton Hill and Cinderford. (j) In South Wales, at Swansea, Dinas Rhondda, Maesteg, Brynmenin and Abercynon. In all, the total number of rescue stations was 46 and of these 10 were scheme 'A' stations with full time brigades.